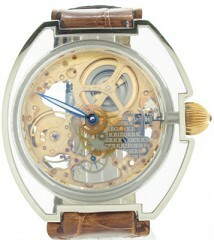 Features: See thru Skeleton Mysterium case! Krieger Skeleton Mysterium See-Through g5100.1.c Limited Edition! Krieger Skeleton Display Mysterium, display see thru. Huge briefcase box & papers & open guarantee card. Mechanical movement, diameter 53mm, Alligator strap with deployant buckle, sapphire crystal, water resistance 50M/165 feet! Retail is $11,450...Sell for $6,750 or trade!